My life has been a journey on and off the water. To most of you, I am an ocean enthusiast and waterman, a professional surfer, windsurfer and paddler. 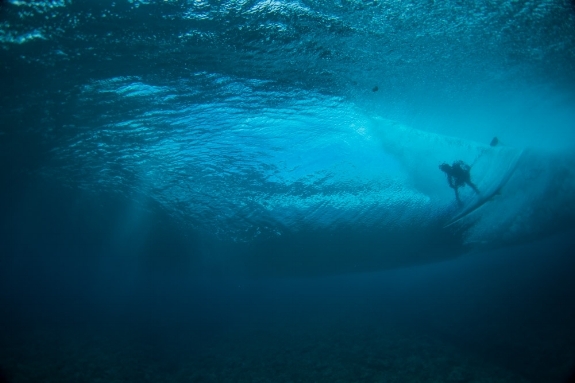 But just as underwater caverns, reefs and extreme rock formations hidden from our sight create the waves and the ocean's personality, there are hidden motivations, dreams, goals, choices and influences that have formed my life from beneath the surface. My environment, family, the world and its people have shaped me into who I am. And in return, I've made the commitment to always work towards goals that not only benefit myself, but also uplift the people and environment around me. A coach and mentor of mine once told me that success is when preparation meets opportunity. Through my experiences, I’ve learned there’s yet another challenge we are presented with when meeting success, and that’s our choice of what we do with this platform of success. Our choices make all the difference, for ourselves and for our communities. The success and health of our planet and our communities depend on us. So, how can we preserve and honor our ancestors, provide for the present and prepare for the future all at the same time? There's a way to do all that through what I call “Blue Life” choices. Living a “Blue Life” means using your influence and success to make choices that take into account what is beneath the smooth surface of the water. How can we all look beyond the smooth reflection of the water, the immediate next wave that is approaching and consider what’s going on beneath the surface? Things like renewable energy, clean water, healthy living and a zero waste business/lifestyle are the foundations that help us build towards a positive future. And they ’re more important than ever. Investments are a time-honored means of preparing for our financial future. There is a way to align our investments with our commitment to positive environmental and social impact. For example, Swell Investing is based on the premise that big problems equal big opportunities. Swell has identified companies addressing high-impact themes like climate action, life on land and life below the water – to name a few. They look “beneath the surface” of problems for investment solutions. Aligning the investment of your hard earned success with your personal “Blue Life” choices is a winning combination. As I started to prepare for my future, I learned that traditional investing often means you're supporting unbalanced and unsustainable means of business such as single-use plastics, tobacco or casinos. That's a problem, and when I become aware of a problem, I do my best to solve it! With “Blue Life” choices we can make this world a better place, we can reinvent eco-innovation and inspire “Blue Life” shifts on a personal and professional level. Now with a platform like Swell Investing, you can plan for your future while protecting the world for generations to come. Sharing stories and insights is a powerful way to build connection and lead to action. In my book, Beneath the Surface, I shared my life’s journals and story. What is your “Blue Life” story? Let’s write the future together. Learn more about how you can make a positive impact on your future, and our planet with Swell Investing.